Hi Rita. This is a really cute card, love the little shamrock you made. I have never heard of that salad before and I thought what a weird tradition to have a salad for your birthday. Thanks for the link to the recipe, I get it now KIND OF! It still sounds pretty strange! What a fabulous challenge this week. Sorry I didn't get to mash things up. I love your card, great idea to use the heart punch for the clover. Sweet! That is a great sketch---I have a favorite go-to sketch that saves me a lot of time, and I agree, Teeny Tiny Wishes is a must-have set of stamps! I love how you created the shamrock from hearts, very clever! That paper has a ton of green it, I really need to get my pack open and start playing with it. Great challenge this week Rita! The papers on your card are SO pretty and I love all the different ways you've been using the sketch! 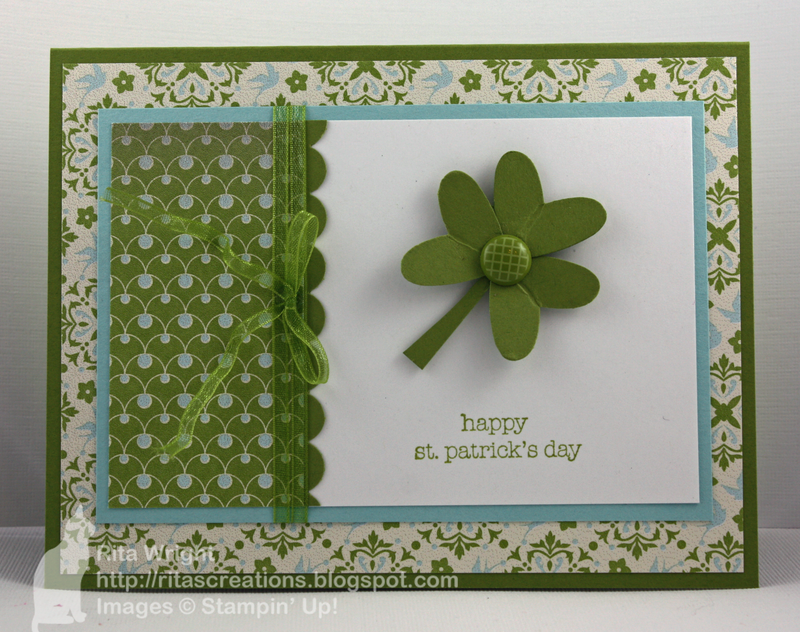 Love the use of the SAB paper and the brad in the center of the clover. Very cute!